How the 95th Civil Affairs Brigade (Special Operations) (Airborne) streamlined a process to gain the best talent through innovative HR strategies and a determination to seek out the best fit! Most Army units do not have the funds, time, or ability to screen officers for vacancies, and this lack of flexibility presents a challenge in selecting top performers for job vacancies. The implementation of the Assignment Interactive Module Version 2 (AIM2) in the Army’s operational manning cycle has sparked a change that is ground-breaking and beneficial to both officers and units in need of talent. The marketplace system provides the officer the chance to voice their personal and professional preference, which Army Human Resources Command can then use to match them with a unit that is seeking their individual expertise and experiences. There is an incredible amount of talent in the Army, and AIM2 gives officers a chance to showcase their skills to available units. This process was successful not only because of the exceptionally talented officers we received, but also because it has initiated a shift in culture from the S1 being an action processing machine to a strategic partner within the staff. While AIM2 affords units who were previously unable to conduct formal selections the ability to identify the best candidates for upcoming vacancies, it requires forward thinking and aggressive human resource management strategies. In the case of 95th Civil Affairs Brigade (Special Operations) (Airborne), the method described below had a measured 92% success rate with the top 10 candidates receiving orders to the unit. It also resulted in 95th CA BDE (SO) (A) ranking as the second most active unit in the Army on AIM2 in the most recent cycle. When developing this process, we first discussed our end state: we wanted to use AIM2 to its full potential and receive the best possible officers for our open requisitions. With AIM2’s “Our Unit” tab, units can market themselves to receive top performers. This information is available to every officer on the move cycle. Prior to the marketplace opening, our HR team collaborated with other staff sections to present the best picture of our unit to movers. We included a video created by our public affairs team, narratives with vignettes of unit accomplishments, and specific opportunities for each grade plate. Providing an accurate picture of life as a support officer to Special Operations Civil Affairs was a quick conversation starter between officers on the move cycle and the strength manager. Once complete, we identified stakeholders for the move cycle- those with the most knowledge on key skills and abilities for each open requisition. Each stakeholder was granted “Our Marketplace” access in AIM2, so they were able to view officers’ Officer Record Briefs (ORBs) and resumes. Week 1: Initial Selection Week. During this time, stakeholders had a full week to identify their top 10 candidates based on SRB and AIM2 resume searches. At the end of week one, the strength manager validated all candidates marked as “Interested” within AIM2. In doing so, officers received a notification via automated e-mail that 95th CA BDE (SO) (A) was interested within one week of the marketplace being open. Indicating interest early in the move cycle gave 95th CA BDE (SO) (A) a leg up in our talent search- we began speaking to talented candidates immediately. We also were able to reduce the pool officers in each requisition from 200 to under 50. 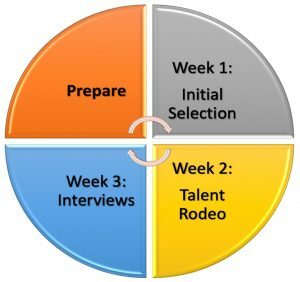 Week 2: Talent Rodeo. The next week we held a talent rodeo. We created a schedule with set times for each open requisition and sent an open invite to stakeholders and any other interested parties in the brigade. The idea was to discuss one specific job opening during hour-long blocks to prevent stakeholders remaining in the rodeo for longer than necessary. Upon arrival to the rodeo, stakeholders were briefed the rodeo rules: voting was limited to “YES” or “NO” on voting sheets provided on the day of. Stakeholders were encouraged to discuss desired experiences and talents, but voting was an individual event, thus discouraging group think. Each of the stakeholders’ top ten ORBs and resumes identified in week one were displayed and discussed during the rodeo, averaging about three to five minutes per officer. Following the event, the strength manager tallied voting sheets- the ten with the highest number of “YES” votes became the brigade’s top ten. Week 3: Interviews. The brigade’s top ten candidates were interviewed over phone or video by a small board consisting of brigade staff primaries, battalion executive officers, and the brigade executive officer. The board’s focus was to determine the ranking order of the 10 identified officers. This provided the officer a chance to demonstrate their ability to perform under pressure and provide key stakeholders an idea of their career goals. If the officer’s career goals were in line with the job opportunity, the likelihood of success in the brigade increased. With the results of the board interviews, we were able to rank officers from 1-10 indicating who we wanted the most and why. Why was this process a success? This process was successful not only because of the exceptionally talented officers we received, but also because it has initiated a shift in culture from the S1 being an action processing machine to a strategic partner within the staff. The brigade recognized how HR expertise was invaluable to the brigade’s mission accomplishment. In the absence of guidance outside of the published AIM2 rules of engagement, our brigade S1 team took a forward-looking and innovative approach that encouraged positive collaboration between staff sections. The result was a stronger team built by selecting the best possible officer for the right job- officers who concurrently received their top choice in assignment. We highly recommend making the most of this expedient system in a way that benefits both the unit and the officer’s future job satisfaction! About the Author: CPT Chelsea L. Marcantonio is from Vicenza, Italy. After commissioning into the AG Corps in 2014, she served in three consecutive Battalion S1 positions in Camp Arifjan, Kuwait and Fort Bragg, North Carolina. CPT Marcantonio is currently pursuing a Masters degree in Human Resource Management from Georgetown University and aspires to be an AG Soldier for Life. The views expressed by the author do not necessarily reflect or represent AGCRA, the United States Army, or official U.S. government policy and should not be construed as such.